Denver’s Rosemary Probst insists on calling me Cindy (no one calls me that). When I taught her my latest polymer rock technique, she insisted on putting rhinestones in her version. Rosemary loves to taunt me in the most delightful ways. 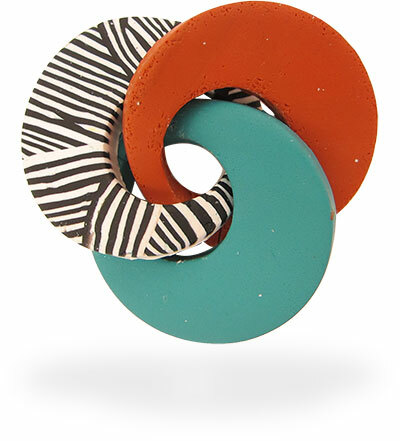 This three interlocked circle pin that Rosey created is simple, clever and fashionable. Discussions about taking your work to the next level have netted results for her. Many of Rosey’s works are sold to support cancer research and Facebook is as far as she ventures into technology. We all know artists like this who don’t seek fame but have happy hands that bring joy to our community. Surely after this post Rosey will stop calling me Cindy. Have a happy weekend. I stopped being “Cyndi” just before I hit 40. I couldn’t imagine being a “Cyndi” well into my 50’s, 60’s and so on. However, my Mother, other family members, old and close friends still call me “Cyndi”. Other than that it’s “Cynthia”! Thanks for this humorous and delightful post, Cindy! Have a great weekend. And thank for this brooch post. I like to think that I keep a keen eye out for all things polymer, following trends and enjoying spotting influences and variations on themes, and then something I haven’t ever seen crops up. I’d love to see other angles, – if we asked real nicely, might Ms Probst show us the back? I’d love to know how it all stays in one place. I LOVE Rosey! Please give her the biggest hug from me. I’m sure the fun is ensuing! Really, Rosemary, the pin is delightful, just like you! I’ll never call you Cindy if you never call me Maggie, or Peggy, or Margie, or Margot! The art work is good, however. When I walked into the workroom, Rosy greeted me as Cynthia! She was thrilled and coerced as I had hoped. As we pulled away from the conference she waved goodbye and shouted, “Goodbye, Cindy”. She still loves to taunt me.